Sniff. I'm so proud!! Oddly enough, she was only up there for 20 seconds or so. It felt like four minutes while we were there. This is a good thing, because it means I was only standing there frozen like a total dweeb for less than a minute. Good stuff. OK, so let's move on. The long awaited squares and stripes post, which works well for this time of year (stars and stripes...get it??). It's really not rocket science, and yet again, there will collective "DUH." when you're done reading, but I like to share so I'm sharing. OK? OK.
First, the squares. The two items you must have for squares and stripes is a level (either the one below or a laser level that sends a beam of light straight down the wall) and blue painters tape. For this wall, I used two inch painters tape for the whole wall. I used the white wall as the background, but if you want a color, you'll need to paint it that color first. Then, the measurements all depend on the size of squares that you want, or how many rows/columns you want. Say your wall is 127 inches -- and you want six columns of squares. You'll subtract two inches for each end of the wall, and each two inch space between each column -- basically each spot the painters tape will go. Now divide 115 by six (for six columns)= each column would be 19.16 inches wide. Do the same for the rows up and down as well. I know I made this seem complicated and it's really not that bad. It may take you a few tries to get the right measurements -- it did me. The rest is easy, it just takes time. I hope that made sense! After you've figured out your measurements, you'll just need to measure off your wall. I use a yard stick, with the measurement marked, and I keep moving it down the wall, marking, say, 19.16 inches up and down the wall. Then take the level and use it to make straight lines on the wall vertically and horizontally. Take your blue painters tape and run it along the lines. You can use the laser level and put the paint along the laser line, (this is how I do it) or you can put a light pencil line down the wall and then tape that off. To make sure no paint bleeds under the tape, I've heard many tricks, but all I do is take my thumbnail and run it down each side of the tape. You can also use a credit card or pan scraper. It works every time for me. Of course, the more colors, the longer it takes. It seems complicated and again, it's not. The great thing about varying stripes is you don't have to measure the wall like with squares. Just figure out what look you want and go. Once you get going, it will go surprisingly fast. Surprisingly. Swear. Pinky swear. I taped off most of the stripes in my son's room within a couple hours, and the total paint time was probably a few hours. This was done by just painting the wall the base color, then taping off one foot columns and painting a shimmer glaze over the base. It's a really subtle look and I absolutely love it. My biggest tip when using painters tape -- take the tape off when the paint is still damp if at all possible!! I've heard from professionals to keep it on till the paint is dry, but when I've done that, it makes a mess. The lines turn out awful, because the tape pulls up little pieces of the paint. When it's damp the tape comes right off, leaving a clean line. If you have any other tips for a clean line or painting stripes/squares, please leave them in the comments! I know many of you have textured walls and I know it can be done, I've just never tried it. ;) I appreciate any other thoughts!! It takes some patience, but the result is so custom and beautiful, you won't regret it! P.S. I went to the best antiques shop in Indiana today and whoooeee, I have some eye candy for you later this week!! If you follow me on Twitter, you have already seen some of them. Fabulous!!! ooooo Love the shimmer paint. I'm going to have to do that! Thanks for such wonderful tips and tricks! did you leave the top a plain color or paint the stripes all the way up the wall above the chair rail? I have heavily textured walls (ugh) and it is more difficult to get the lines straight without having the paint bleed under the tape. I put the tape on and then put a light coat of the base color over it to seal it. This has worked well for me. I love your son's room. The stripes look adorable in varying sizes. 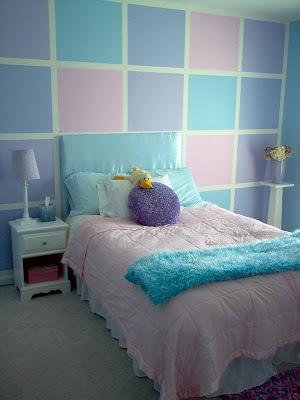 I also really like your daughter's room, personally I'm not a fan of exact symmetry, but to each their own. Awh! I would be so proud of my sister too!!!!! A level? That is that ruler looking thingie with the pretty little bubble glass thing on it right? Just kidding! Both rooms are outstanding! I really like the squares, but I would be afraid that they get to be too much for me after living with them for a while. I have the same problem as Amy, so I am going to try her trick. I also TOTALLY agree with you on taking the painters tape off when it is still damp. I just painted stripes on my sons walls, and in my bathroom. The trick I used was to paint the base coat color over the edge of the paint, really making sure to work it up under the edge of the tape. After it dried, I put the stripey color on. You've got to pull the tape off while the paint is still wet, but I got beautifully straight lines! That is... I got beautifully straight lines in my sons room. In my bathroom... not so much. Wish I had known this trick for the first go 'round. Wow. No way in a million years would I try this. I will leave it up to the professionals! I don't even know your sister and I'M proud of her! I especially like the part when she throws her arms around Donnie ;) Love it! Clear paintable caulk- caulk with your finger on the side of the tape, then paint, and peel! For the nursery, did you need a full gallon for each of the green colors? I love it and want to do it- just don't know how much paint i'll need! truth be told i screamed a little when i saw the video of your sister. Great video! I am so glad someone caught on tape for you and your sister, that is so awesome! Oooh, gorgeous. You are the Queen of Stripes ! Glad you had so much fun at the concert! You did an excellent job and obviously have the patience for this. For the squares - that's too much math for me, but I think I could handle the stripes. You've given me inspiration for when we down-size to do something different in one of the bedrooms and I think stripes might be it. I did stripes in my daughters room and she has textured walls. It's pretty simple to fight the bleeding issue. Just tape your lines down and then add another coat of base paint over the whole wall (or just over the tape if they're far apart... for me it was pretty much easier to just go over the whole thing again). That makes sure that the paint color that gets under the tape is the same color that's already under there (did that make sense?) And then you just paint away (once dry, of course) and there will be no extra bleeding. Works great! I LOVE the stripes too~ Glad to hear that it doesn't take a ton of time... I am in the mood to repaint - but we'll be moving in a year and I'll probably just wait until our next house. So - tucking this in my file of things to try then! thanks!! Ladies, I too have those annoying textured walls on EVERY SINGLE WALL in my house. I also strongly recommend using a little primer (or base wall color depending on your project) to "seal" the tape. Also, if you're willing to drop a little more coin, the green frog tape that is available at some paint stores is really excellent paint tape. Probably not worth the extra expense for a normal project, but it might be worth it for something like stripes if you are messy like me! OMG, I loved that video. You'll have to post some pics soon. I hadn't heard of painting the tape with the base coat as others have suggested, so that's pretty neat, but what if you don't have the base coat?? I remember watching one of those inexpensive design shows mention running a clear acrylic sealant over the edges and that seemed to work. I like the stripes, especially the greens that are just a little different. The squares are VERY cool, but I wouldn't have the patience! Thank you for all the tips on stripe painting. I want stripes in the dining room and bathroom. The walls are still plain! Just call me "chicken." AHHHHHHHH AHHHHH! For your sister with Donnie!! When I hear their music instantly I'm a 14 year old girl with a crush. Love those stripes in your son's room, and putting the chair rail on afterward was an inspired tactic! Very impressed at the tip above for painting the tape with the base color too - brilliant! My husband did this in our nursery! It was a lot of work, but I was exempt, because I was pregnant at the time! 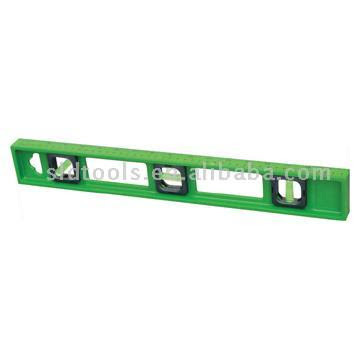 wow you and that spirit level are good! Love squares. Love stripes. Aren't I the patriotic girl? Fabulous job, you're such a pro. Clear caulk works super well! The first time I pulled off the tape after it dried and then had to go back and very carefully fill in all the paint it ripped up. But, the caulk is AMAZING!!! I love the stripes...great job girl! 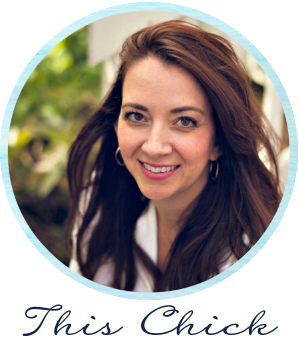 I just recently found your blog, and let me just say that you are a woman after my own heart! I would MUCH rather find something thrifty to "makeover" for my home than to buy an expensive something ready to hang. It's my own form of hunting, I guess. I'm so glad I found you. I WILL visit often! Two tips (probably already in your many comments above): run a light, light layer of caulk over the edges of the tape prior to painting the stripes. Or paint some clear acrylic paint stuff lightly over the edges of the tape prior to painting. Either leaves absolutely perfectly flawless lines. I love the green stripes & how you chose different widths--thanks for yet another great tutorial. Sarah, love the stripes, even though I've never tried them. Maybe I'll have to find a spot for some stripes. Looks great! And I'm glad you liked the beadboard wallpaper. I figured you girls who love the real product might think it's a bad thing, but it really does look real in person too. painting over tape w/basecoat works, so does acrylic matte medium (what PJ was talking about) you can get it at any craft or art store. Both work great. Thanks for posting! I'm a stripes junkie. Love them. DEFinitely going to be trying this! Hey I want to do this in my daughters room. I was going to paint it all pink and then add verticl glazed stripes over the top. What kind of shimmer glaze did you use? Where did you get it? like home depot? and tips for me? My favorite way to seal the painters tape for ANY part of the room is to use the Translucent Faux Glaze Medium that you would use for any kind of a faux finish. Since I bought a gallon years ago from Home Depot I am still using it. It dries SUPER FAST and (obviously) clear. I usually slap a thin layer down whenever I am doing my moulding. I use a cheap-o sponge brush from Michaels and by the time I'm finished with the room the place I've started is dry and ready to paint! PS. I LOVE your blog! Okay, over a year since your last comment on this post...better late than never right? I love your stripes in the master bedroom. Im thinking stripes for mine. I would love to know the name of the shimmer paint. In the past for my stripes I tape off with blue tape and run a thin layer of clear paintable caulk on the edge. I take a glossier version of the base coat to make the accent stripe. Hello! I have been regularly stalking your blog since I discovered it about a month ago! I LOVE it!!! I went to Lowe's to day to look at shimmer glaze, and was very confused. Did you add a tint to it or ?? ?